When I recently attended a portrait day hosted by Chris Harper FBIPP, one of the other photographers asked me why I was there. After all, I’m a Fellow of the BIPP (British Institute of Professional Photography) myself and have therefore reached the qualification and distinction peak. Here’s the thing – as any established professional photographer will (or should) tell you, it really doesn’t matter how long you’ve been in the game, or how many awards you’ve won. You’ll still feel that you’re scratching the surface, there is still so much more to explore and see. I’ve been to enough high-level seminars to know that some of them will read like a who’s who of the photography world. Sometimes I’m the one doing the speaking, and it’s always gratifying and uplifting to see some of the photographers I know and admire in my own audience. We all have photographers who we follow and we all have our own favourite genres. I’m classified as a portrait photographer and the vast majority of my work is environmental. This means using a place other than a studio, and it also means that we don’t set up a portable studio either. Instead, we use elements of the environment. You can create studio style photographs in that way, if you want to. But you have the addition of varied concepts which you can identify, create, and exploit. I’ve always liked Chris’s work because he’s something of a specialist, and that specialism is male fitness photography. Anyone who has studied figure work will appreciate why the subject can be so compelling. 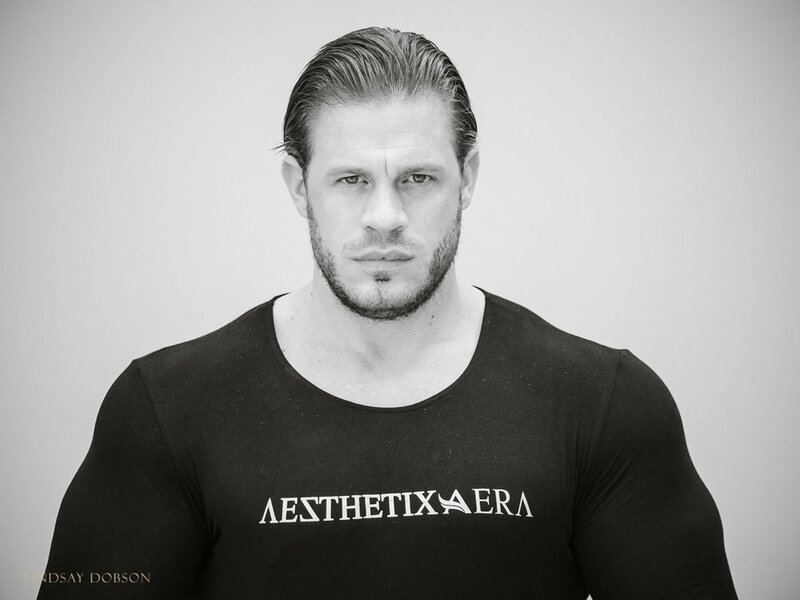 Plus it isn’t often that I will get the opportunity to work with the kind of models which Chris will provide to us – successful body-builders who have elevated their flesh to the highest level. This doesn’t just mean photographic opportunity, there is also the talking which invariably takes place when we have a break – and I find that fascinating as well. You don’t need to rig up lights unless you’re shaping your subject for a special purpose – simple reflectors can often be all that you need. I mostly use natural light in my work but I also enjoy using additive lighting at times, especially if I want an element of drama in the image. It’s also important that the feel of the shoot matches the subject – these photographs were kept deliberately stark for that reason. You can use pretty much any sort of camera for controlled portraiture, but as always your lenses are key. You’re likely to be working with full body shots through to head shots. If you favour prime lenses that could mean anything from a 50mm field of view to 135-150mm. In zoom terms a good classic choice would be a lens covering 70-200mm. Given that I am a Micro 4/3 shooter I carry out most of my portraiture using the little Olympus 45 f1.8 and the Pana 35-100 f2.8. Those are the lenses I used on this particular session. (For groups, or in tighter spaces indoors, I might go with the PL25 Summilux f1.4 or the Oly 25 f1.8). I could also have happily use the Oly 75 f1.8 but sometimes when I’m working quickly and I’m having to reframe in a hurry, nothing beats a good zoom. Both of the lenses I used on this occasion are optically superlative and are very sharp. Thank you to Chris for a hugely enjoyable day. And thank you to our wonderful model, Peter.